Professional development or continuing professional development (CPD) is the practice of maintaining and developing the skills and knowledge required in your job role. In an industry as fast-moving as the motor industry, it’s vital that your skills keep pace. The IMI has partnered with specialist training providers to create a portfolio of CPD courses and eLearning. Courses cover a range job functions and are designed to support the needs of the sector. CPD enriches your knowledge, keeps you currently competent, and improves your promotion and career prospects. Organised by IMI members, Member Association events (MAs) provide free CPD and networking opportunities for members. You can train face-to-face, via workshops, online through innovative webinars and e-learning, or even from your mobile. 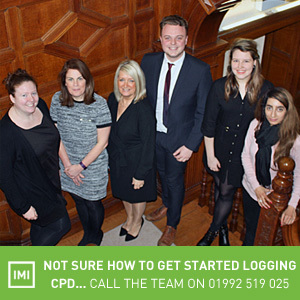 To discuss training and development needs for yourself, your team and your colleagues, contact our Professional Development team. Some of our CPD courses can also be delivered for you in-house, either in their current format or tailored more specifically to your business needs. Contact us for more information about how we can provide these courses to suit your requirements.